Spain boss Vincente Del Bosque has admitted Iker Casillas’ absence will be a blow, but insists he has faith in the goalkeepers lower down the Roja pecking order. The 31-year-old is set to miss Spain’s friendly with Uruguay next week due to a fractured hand, an injury that could potentially sideline the Real Madrid stopper for a further three months. Victor Valdes and Pepe Reina will be among the candidates to step in for Casillas and, while Del Bosque has noted the importance of his captain, he is confident he will be adequately covered. 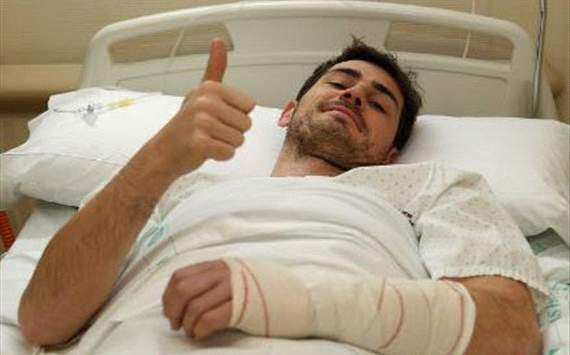 “Iker Casillas will be a significant absence, because he is the most capped player for Spain and has an impeccable track record,” Del Bosque told Murcia. “But we must look at other goalkeepers who are also very good. The competition is great and it is not easy to choose. The 63-year-old also revealed he will introduce the new generation of La Roja stars and hopes they can adapt well to the international stage.